You can taste Gokyo, Sakai Shuzo from Yamaguchi prefecture, and Aizuchujo, Tsurunoe Shuzo Co.,Ltd. from Fukushima prefecture. Sakai Shuzo is located in Iwakuni, Yamaguchi prefecture. Here you will find a beautiful, curiously constructed bridge that is one of Japan’s Three Famous Bridges, which Kintaikyo is essentially made from five small bridges connected together in order to make a single massive bridge. The name of Gokyo (Five bridges) comes from Kintaikyo. Water for brewing is drawn from Yamaguchi prefecture’s largest stream: A Nishiki River underground soft water stream leading to a well inside the brewery. This super soft water makes a feature of Gokyo tender and highly fragrance. Elegant Ginjo aroma drifts gently. Founded 1794. Tsurunoe Shuzo is located on the Nanukamachi-dori street in Fukushima. Nanukamachi-dori Street is a nickname given to a street in Aizu-Wakamatsu City. The street is about 700m from Nanukamachi station. During Edo Period (1603-1868), Aizu-Gokaido road and Yonezawa road passed through the city, which abounded with shops and inns; this prosperity lasted until 1950s. These days, you can see shops and buildings that built in kurazukuri style and western-style selling lacquerware and local cuisine. Taisho Roman (a trend of thought or cultural events that conveys the atmosphere of the Taisho period.) atmosphere is felt throughout the city. The brewery is also traditional historical building. Yuri (Lily in Japanese) is characteristic of delicate flavor which is brewed by female Toji. In the brewery, you can taste sake. There are limited sake only you can buy in the brewery. You can taste Hanagaki, Nambu Shuzojo from Fukui prefecture, and Kumpeki, Kunpeki Sake Brewery from Aichi prefecture. Ono City is surrounded by a magnificent natural environment. It has many mountains including “Arashimadake,” one of the selected “one hundred exquisite mountains of Japan.” Ono City has also been selected as one of the “one hundred exquisite towns with water wells in Japan” designated by the National Land Agency because the city has famous spring water, “Oshozu,” which was selected as one of the “one hundred exquisite waters of Japan.” Ono City’s impressive old scenery and its rich nature is also known as “Yui no Kuni.” Because of that in Ono city, there are 4 sake brewers which have existed for a long time. Hanagaki Super dry (Chokarakuchi) Junmai is Sake Meter Value (SMV) 12+. The higher number, the drier. This is not added brewing alcohol, It is made by complete fermentation method of brewing. If you are super dry fan, you should try it. Founded in Aichi Japan, Kunpeki Sake Brewery has a history of more than 100 years in sake brewing. It is located in Konan city. In this city, there are 3 sake breweries. They use the Kiso river’s underground flow water for brewing sake. 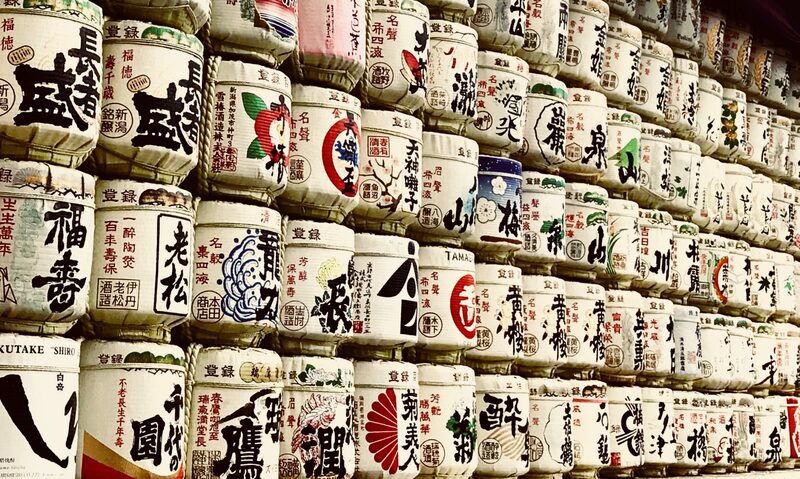 Their sake is conscientiously prepared and brewed in small batch. Every step of sake making is accomplished by united efforts of the whole family. The yeasts are carefully screened and selected, only the ones that are approved by their master brewer are used for brewing in their brewery. 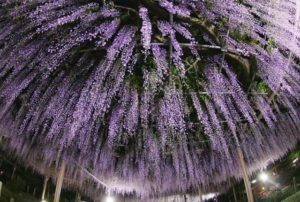 In Konan, every year from the mid April to early May at the Mandaraji Park, Konan Wisteria Festival is held. Japanese wisteria mesmerize people by its mysterious beauty and fragrance. The wisteria pergolas set up in the park have around 60 wisterias from twelve species ranging from early to late bloomers, and visitors get to enjoy a variety of forms of wisterias, from brightly colored wisterias in purple, crimson, white and so on, and from long, elegant flower clusters to short, pretty wisterias. If you are to come Japan from mid April to early May, why don’t you enjoy tunnels of wisteria in full bloom while drinking sake?